Sheet pan chicken and vegetables is a must-have recipe for all those busy weeknights. 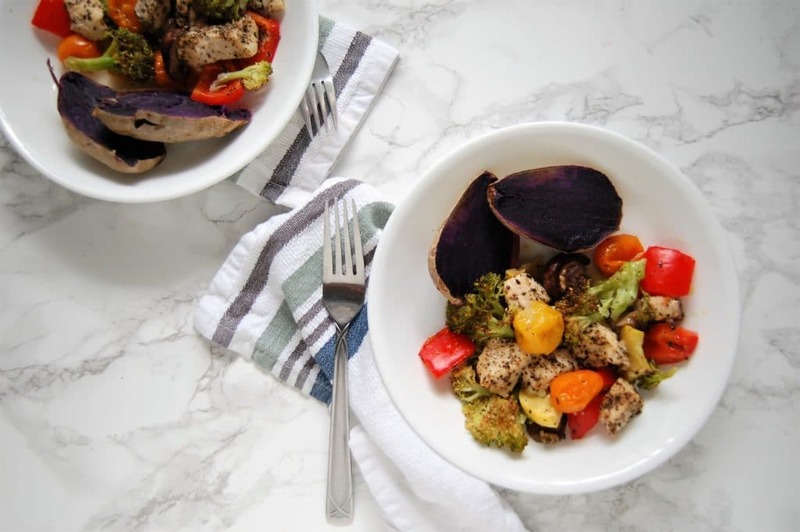 Use whatever vegetables you have to create a protein and fiber-rich dinner in under 30 minutes! Raise your hand if you like cooking, but sometimes you’re just super busy and need a quick, wholesome dinner. 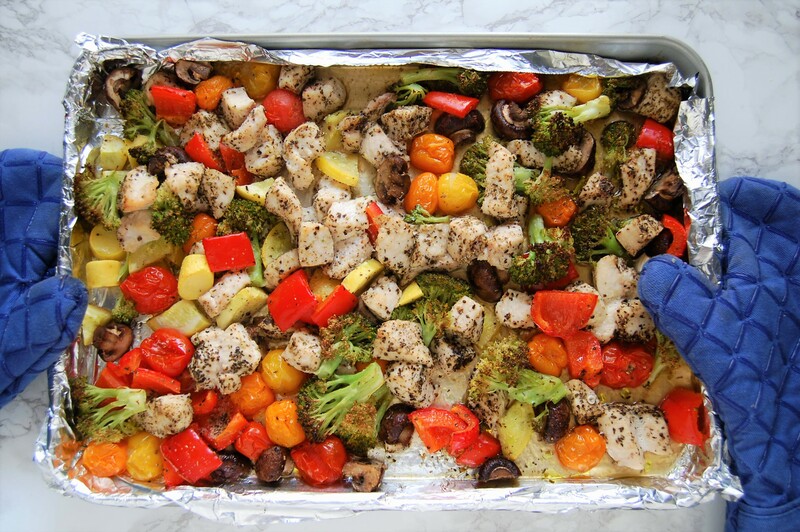 (*raises hand*) This recipe for sheet pan chicken and vegetables is for YOU! Sheet pan chicken and vegetables basically meets all the criteria for a weeknight dinner. Even if you don’t prepare anything ahead of time, this sheet pan dinner will be on your table 30 minutes after you start chopping chicken and veggies. If you’re a master meal prepper, you can totally chop the chicken and veggies beforehand and store in a gallon-size resealable bag with the olive oil and spices already added. Then you’ll just need to empty the bag on a sheet pan and stick it in the oven! You can certainly load up on the protein and fiber-rich vegetables in this easy sheet pan dinner, but I tend to enjoy something starchy with my dinners (like rice, sweet potatoes, etc.). While this sheet pan dinner is in the oven, you could quickly make some instant brown rice to pair with it. Or, roast a few sweet potatoes over the weekend. Even more last minute? Poke a few holes in your sweet potato with a fork, wrap it in a damp paper towel, and microwave while the sheet pan dinner is cooking (like what I did here with these purple sweet potatoes). however else you get creative! Let me know if you try it! If you do, be sure to snap a pic and share it on the Nutrition to Fit Facebook Page or on Instagram by tagging @nutritiontofit #nutritiontofit. 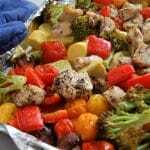 Sheet pan chicken and veggies is a must-have recipe for all those busy weeknights. Use whatever vegetables you have to create a protein and fiber-rich dinner in under 30 minutes! Preheat oven to 450 degrees. Line a sheet pan with foil for easier clean up. 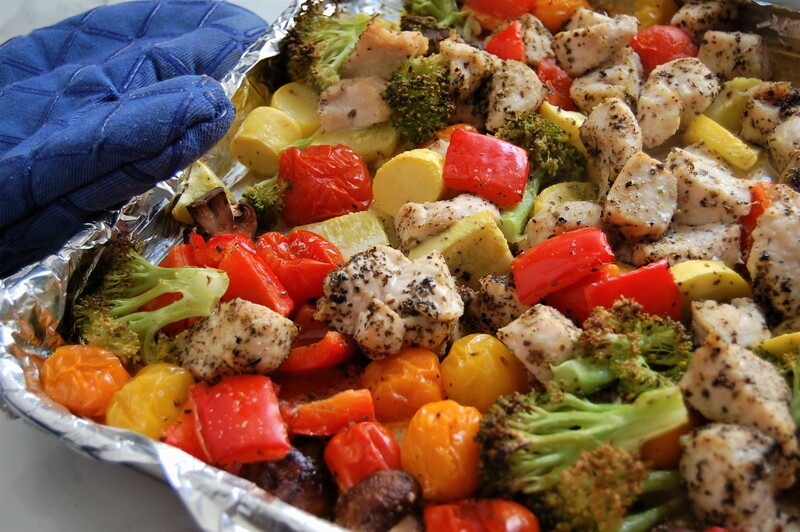 Place all chopped chicken and vegetables on the sheet pan. Top with olive oil and spices, and toss to combine. Bake for 20 minutes, or until chicken reaches an internal temperature of 165 degrees. Make ahead tip: Chop all vegetables and chicken and place in a large resealable bag or container with the olive oil and spices. Can be stored in the refrigerator overnight. Nutrition information will vary based on which vegetables are used. I made this for the first time this evening and used cauliflower, zucchini, brussels sprouts, and tomatoes. My husband, brother-in-law, and I all loved it. This recipe’s a keeper. Thank you so much for the wonderful feedback, Joyce! That veggie combo sounds amazing!! Wow! I picked this recipe to try as my first “sheet dinner”. 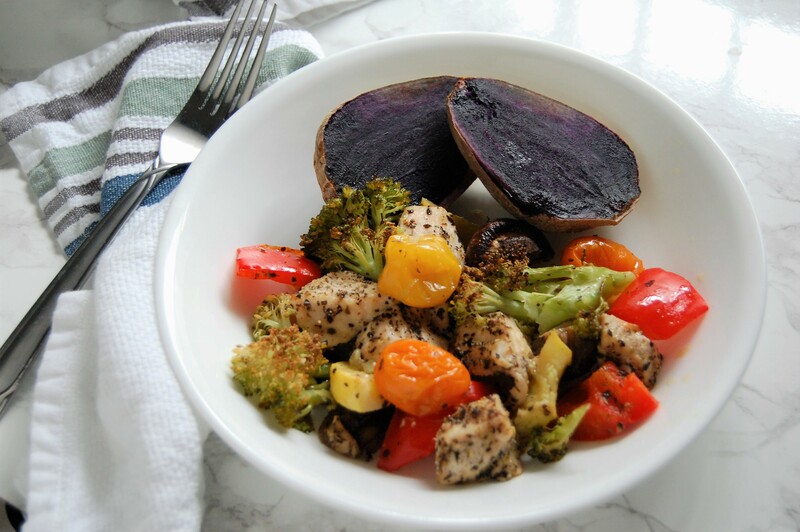 I am trying to get healthier, I’m doing the Whole30 and am salad out… I was skeptical … but I was so pleasantly surprised at how easy and incredibly tasty this recipe is! I used different veggies, but it was so good! I have a very picky teenager and he even ate it! So wow! Tasty, healthy and my teenager will eat it? I can’t ask for anything better than that! Thank you so much for this recipe! I will be trying more! This comment means so much to me, thank you so much for taking the time to share! To me, this is what it’s all about – easy, enjoyable meals everyone can enjoy! Looks delicious. Will try it and let you know. Just wondering how many this will serve? Thanks, Rita! It serves 4-6, depending on how hungry people are (or if you have any tiny toddlers in your house like I do that may not eat as much as their dad) 😉 Any leftovers are fantastic to be frozen for another easy dinner or added to things like grain bowls, salads, and wraps the next day. 🙂 Let me know if I can help in any other way!